20 March How Do Home Care Agencies Screen Caregivers? Having a caregiver in your home can be an unbelievably rewarding experience. Depending on the level of care your loved one needs, your home caregiver might provide basic to moderate support from household chores and errands to hygiene help and more involved care. They will often become trusted companions - an extended part of your family. That is, of course, the ideal. Choosing a caregiver for an ailing family member can be scary. You want to choose the best person who will fit in your home. There are so many unknowns in hiring a stranger. Will they be someone your family likes on a personal level? Will they be capable of handling any medical emergency? Can I trust them in my home when no one is there to watch over them? These are some of the concerns that make working with a home care agency an ideal fit. Because your caregiver will be intertwined with the lives of yourself or a loved one, the process for screening caregivers should be very rigorous. If you've never interviewed someone in this field, you might not know the right questions to ask, how to find the right resources, how to check references or even the most important factors to consider. Here’s some background for those who may be evaluating caregivers on how the process works. 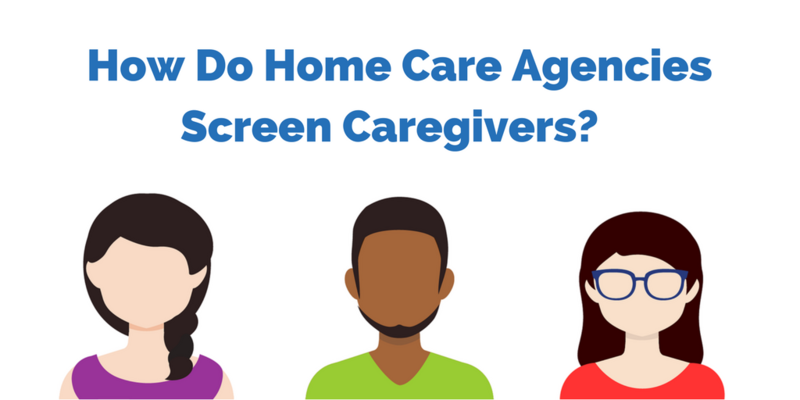 How Are Caregivers Screened Through a Home Care Agency? A home care agency has a protocol they follow to properly assess caregivers. These steps may not be identical with every agency, but in general will (or at least, should) include all pertinent facts to make certain that your caregiver is not only competent and trustworthy, but a good fit for your home. A comprehensive screening includes a thorough background check, detailed inquiry into references and credentials, and multiple phone and in person interviews. An agency may also test their caregivers on specific skills to determine real world proficiency. Many agencies offer caregivers education courses to ensure that they each follow a company-wide protocol. Find out what it means to be a Bluebird Caregiver with with short video. Caregivers come from different healthcare backgrounds. They may have certification as a registered nurse or home health aide. Many have experience as home caregivers. Some professionals may have previous experience as part of a hospital's staff. An agency should take a great deal of care in checking their certifications and work experience. Any references should be contacted and certification information verified. The agency makes certain that any certification and licensing is up to date, as well. They also organize their references so that each caregiver can be best matched for positions requiring their skill set. A home care agency realizes that a caregiver will often have open access to your home, personal possessions, and likely an impact on your loved ones' well-being. It's important that they conduct a thorough background check that extends beyond professional certification or previous employment. State Criminal Record. A criminal background should exclude most home caregivers from employment. Federal Criminal Record. An agency will verify that any home caregiver has not been convicted of federal crimes. A Federal background check may include taking fingerprints and verifying that there's no criminal record in another state that may not appear in a state criminal record search. Driving Record. A home care agency will also check the DMV record for caregivers. An agency may also check any federal exclusion lists or whether there are other red flags in the caregiver's background. Each home care agency has their own protocol to follow in the interview process. They may differ in ways to organize and assess, but the basic function is the same - to competently assess each caregiver in person. Your agency may conduct phone interviews to initiate the process. They will often schedule more than one face-to-face interview. In-person interviews may be held by one agency hiring manager or several. Some agencies have prospective caregivers complete exams during the interview process to better judge their performance. In some cases, a home care agency will offer classes and orientation seminars designed to make certain that caregivers have brushed up on different aspects of the profession. They may also verify the caregiver's driving record and perform an inspection of their vehicle, if it will be used to drive prospective clients. They will often have caregivers complete a full medical evaluation and update any inoculations prior to offering employment. When choosing a home care agency, it’s encouraged that you ask questions. Make sure that they explain their process in evaluating home caregivers, and that you know what an individual caregiver's background is before placing them in your home. Remember, too, that even an experienced, excellent caregiver might not fit in with your family on a personal level. That's perfectly okay. Your loved one should have a caregiver who they're comfortable spending time with. Consulting with the agency prior to making your decision will help you reach a decision most likely to benefit you or a loved one.